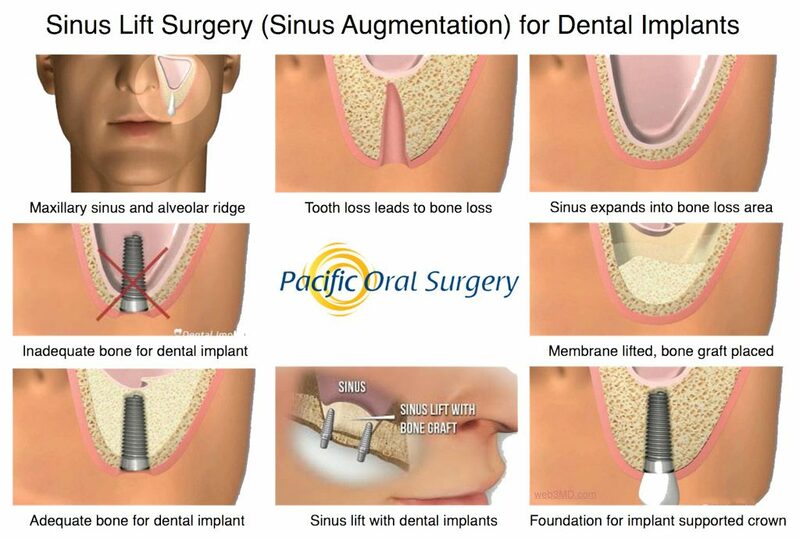 Sinus lift surgery, or sinus augmentation, is a common bone grafting oral surgery procedure performed on the upper jaw in order to increase the amount of bone between the maxillary sinuses and the jaw so that dental implants can be successfully placed. Oral surgeons frequently utilize sinus lift surgery to augment the jawbone because the upper jaw is often deficient in bone quality and quantity. The maxillary sinuses are hollow spaces situated behind the cheek bones and above the upper teeth. The roots of those upper back molars often extend into the sinuses. When tooth loss or extraction occurs, little supportive jawbone is left. During sinus lift surgery, the sinus membrane is lifted upward and bone is added between the sinuses and the jaw. Sinus lift surgery is used in cases where the upper jawbone height is insufficient or the sinuses are too close to the jaw to place dental implants. Jawbone anatomy is such that the upper jaw naturally has less bone than the lower jaw. Some sinus lift patients simply have a smaller jawbone while others have jawbone loss. Sinus augmentation provides a strong bony foundation by bone grafting for dental implants. Tooth loss: Extraction or missing teeth eventually lead to bone resorption (absorption back into the body) if the space is left vacant. Periodontal disease: Gum disease can cause bone loss if left untreated. Oral pathology: Cysts or tumors can damage the jawbone. A toothless, or edentulous, area is known as a ridge. The collapse of the tooth socket, together with an expansion of the maxillary sinus floor (which occurs when a molar is lost), causes the jawbone to thin out, resulting in less volume available for the dental implant. Sinus lift surgery is an in-office procedure which is typically performed with local anesthesia or IV sedation. In more complex cases, general anesthesia may be employed. 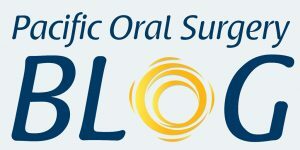 During sinus lift surgery, the sinus is raised and a bone graft is performed to allow for eventual osseointegration, the process in which the regenerated bone connects with the prosthetic implant. Several techniques are available to perform the sinus lift procedure. Lateral window technique is considered the traditional sinus augmentation surgery during which the oral surgeon makes an incision in the gum, exposing the bone. A window is made into the sinus and the piece of bone cut out is pushed into the sinus cavity. The bone graft is placed in the space underneath. The incision is sutured closed, leaving the bone graft to heal for 4-6 months. In some circumstances, the implant is actually placed at the time of the sinus lift procedure. The osteotome technique is a less invasive sinus lift surgery that can be utilized when over 6mm of natural bone height is present and the sinus floor requires less than 4mm of elevation. A flap of gum tissue is cut to form a socket in the bone. An osteotome is used to tap the sinus floor into proper position. 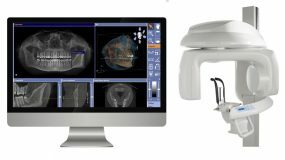 The dental implant is typically placed during the osteotome sinus lift surgery, and bone integration takes approximately 4-6 months. Your recovery time will depend on the type of sinus lift surgery you undergo. Other than avoidance of strenuous activities, most patients do not have any major limitations. You may experience some swelling around the surgical site and light bleeding from the nose or mouth. Most patients have little discomfort after their sinus lift procedure. Your surgeon will provide detailed post-operative instructions after your sinus lift surgery. Sinus lift surgery is considered an extremely safe procedure, however, as with any surgery, risk is involved and complications can occur. The greatest risk with a sinus lift involves the sinus membrane becoming pierced or torn. If the sinus membrane is punctured during the procedure, it can usually be stitched or patched. In rare cases, the sinus lift surgery will be halted and the membrane will be allowed to heal before another surgery is performed. Sinus membranes tend to thicken during healing, thus allowing for a more successful second surgery. 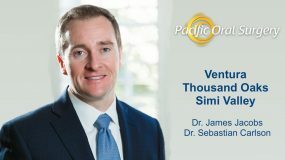 Having an experienced oral and maxillofacial surgeon, such as the doctors at Pacific Oral and Maxillofacial Surgery, perform your sinus lift surgery will greatly reduce the risk of complications. 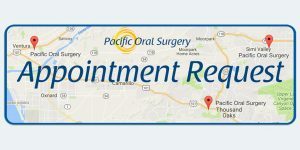 If you are considering dental implant surgery and would like to arrange a consultation with a doctor at Pacific Oral Surgery, please submit an online appointment request or call one of our Pacific Oral Surgery offices located in Ventura, Thousand Oaks and Simi Valley.